Wildlife also have their fill of both the leaves and the nuts which also go by common names like deer nut, goat nut, pignut etc., but the wax that constitutes nearly 50% of the nut is generally indigestible. It passes unchanged through the digestive tract of mammals, including humans, making this edible oil an effective laxative. Jojoba oil is unique in that, unlike most other vegetable oils, it closely resembles sebum, a waxy substance produced by our skin glands, so it can act as a natural skin conditioner. It has nearly replaced animal fats in the manufacture of skin lotions and creams. As a matter of fact, this oil rode into popularity on the back of the opposition to whale oil which was the traditional base of many cosmetic preparations earlier. Jojoba oil has a slight nutty smell and clear golden color in the raw form, but the refined oil is completely odorless, negating the need for any perfuming agents when used for cosmetic and healing purposes. At the same time, it is a good carrier oil for several essential oils. Since the Jojoba wax has a very low melting point, it practically remains in the liquid state all the time, and can be used directly without dilution. Also, being a wax, it does not have as much of a greasy feel as oils. Want to try Jojoba oil for yourself? Pick up a bottle of Leven Rose Jojoba Oil from this page on Amazon. It is the most popular Jojoba oil and widely regarded as the the highest quality. Soaps and most other skin cleaning agents strip the skin of the sebum that skin glands produce to lubricate the skin and protect it from drying out. Every time we wash our face and hands, even with plain water, we’re removing a protective layer of sebum along with dust and grime. The cold and dry air in winter and air-conditioned interiors dry out our skin at a faster rate than our skin glands replenish the oil supply. Dehydrated skin is vulnerable to irritants that cause dermatitis and germs that are constantly looking for entry points into the skin. Keeping your skin hydrated by locking in the moisture and protecting it from the drying effects of the environment constitute basic skin care. Being a waxy substance, Jojoba oil can seal in the moisture and create an effective barrier to external elements. It is so structurally close to the secretion of the sebaceous glands in the skin that it is readily accepted and tolerated. You can rub a few drops of Jojoba oil between your palms and apply it on the face and other exposed parts whenever you venture out and after washing your face every time. For a deeper moisturizing effect, warm up a spoonful of Jojoba oil and massage it in after washing the face at bedtime and leave it on overnight. Pure Jojoba oil is fully absorbed into the skin, leaving it feeling soft and smooth. Oily skin is the result of overactive sebaceous glands in the skin, found more often on the face and the scalp. Oily skin can quickly gather dust from the environment and make frequent washing necessary. Not only does it look unsightly and make you feel uncomfortable, it can be the starting point of many skin problems such as seborrheic dermatitis, acne, and dandruff. If you’re troubled by oily scalp or trying hard to mask your shiny forehead and nose under layers of makeup, rubbing in Jojoba oil on the affected parts will give wonderful results. It is counterintuitive to use this oil, or any oil for that matter, on oily skin, but surprisingly Jojoba oil can help reduce oiliness. This is by modulating the sebum production. Acne is a common adolescent problem resulting from the increased sebaceous gland activity during this phase due to the hormonal changes associated with puberty. However, the problem can persist well into adulthood in many cases. Excess sebum production is just the starting point of the problem. Acne develops when the hair follicles get blocked by the accumulation of sebum, keratin and other cell debris that form a comedone that may first appear as a whitehead or blackhead. It is often complicated by bacterial infections, particularly by Propionibacterium, as well as inflammatory reactions of the skin. Jojoba oil works in several ways to counteract acne formation. First, it acts as a deep cleanser. Being a liquid, it can penetrate deep into the hair follicle; it can dissolve the sebum deposits and help dislodge the comedone, thus clearing out the blockage. Secondly, Jojoba oil has antibacterial properties that help control bacterial growth in the hair follicle. It acts as an anti-inflammatory agent, soothing the irritated skin. When used regularly, Jojoba oil can control acne. The Vitamins A and E in the oil also may have a role in this. Jojoba oil can very well be a safer, all-American alternative to the Australian Tea Tree oil which is known to have some toxic effects at higher concentrations. Jojoba oil can take the place of your regular lip balm which probably has a petroleum jelly base. The waxy oil can form a barrier that effectively locks the moisture in and keeps the lips soft and supple. Although dabbing on a drop of Jojoba oil can protect your lips from the drying effects of cold and wind, you can make your own easy-to-carry, lip balm by mixing it with pure beeswax. Cuticles are very tender and prone to drying up, especially if you use nail polish removers all too often. Cuticles play an important role in protecting the nail beds underneath from infections, so it pays to keep them in good condition. When your cuticles look dry and torn, Jojoba oil can come to your aid. It is as good as any cuticle oil you can find, if not better. Jojoba oil contains vitamin E, and also has anti-inflammatory and antibacterial properties to boot. Rub one or two drops into the cuticle area after bath. Once a week, give a thorough cuticle treatment by soaking the nails in warm water for 5-10 minutes before applying the oil. This facilitates better absorption. Our hands and feet are among the most hard-working body parts. But the palms of the hand and the soles of the feet do not have the sebaceous glands that keep the skin elsewhere in the body soft and supple. Dry weather can take its toll on these extremities and dry them out. Cracked feet are common in winter and also in hot summer months. Aging, diabetes, and thyroid disorders predispose people to dry hands and feet. Frequent washing with soap and other chemical cleaners, especially during the flu season, also results in dry hands. Applying Jojoba oil to the hands and feet can make them soft and smooth. To get the maximum moisturizing effect, soak the hands and feet in warm water for 5 to 10 minutes and dry them with a towel before massaging in the oil. It will form a thin waxy layer that keeps the moisture in and gives a smooth feel to the skin. If there are hardened areas, you can gently rub them down with a pumice stone before drying the feet. Regular application can prevent bacterial infections developing in the cracks and help heal them gradually. Eczema is an allergic reaction of the skin to various irritants, including commonly used dyes and the chemicals contained in soaps. Psoriasis is an autoimmune condition that causes buildups of dead cells on the skin, causing scaling and inflammation. Both conditions are characterized by dry, itchy patches that are prone to secondary bacterial and fungal infections. Jojoba oil has been found to be effective in giving considerable relief to people with these conditions. Jojoba oil acts as moisturizer, relieving itching and dryness. It also forms a protective layer over the skin, forming a barrier to external irritants, which can be an advantage in the case of eczema. The skin inflammation is reduced by the anti-inflammatory property of the oil. It can also reduce the risk of secondary infections by preventing the entry of germs through the inflamed and cracked skin, besides offering extra protection with its antibacterial and antifungal properties. And last, but not the least, the oil is rich in antioxidants that may help modify the immune system. You may be religiously applying sunscreen when you have a beach holiday, but sunburn is not exclusive to beaches. If you find your skin turning red every time you step out, it indicates skin damage from UV exposure. This inflammation can be relieved by applying Jojoba oil over the affected area. The vitamin E and B-complex vitamins in the Jojoba oil helps in damage control and skin repair. Under the protective layer of this waxy substance, the skin can regenerate and normalize. Every hair on our head falls when it comes to the end of its life cycle, but we continue to maintain our total hair volume more or less steady because new hair sprouts in the place of the fallen ones. It is normal to lose anything between 50 to 100 hairs a day, but if we lose more hair than usual or fail to regenerate new hair at the same rate as the hair fall, noticeable thinning may result. Lack of proper nutrition, various abnormal skin conditions and aging can cause hair loss. Damage to the hair follicles and blockages in them can prevent or delay new hair growth. How Jojoba oil controls hair loss is by helping the follicles grow new hair. There are sebaceous glands inside each hair follicle. As the hair shaft grows out of the follicle, it carries a coating of sebum that protects the hair. The sebum and other debris can sometimes clog the follicle, preventing the smooth growth of the hair. Jojoba oil can easily seep into the follicles and dissolve the sebum buildup, clearing up the blockage and facilitating the growth of new hair. The vitamins and minerals in the oil can nourish the skin and improve the overall health of the scalp. Applying Jojoba oil to dry and frizzy hair can help moisturize and condition the hair, making it more manageable and tangle free. Apply the oil to the hair before wash or along with shampoo. This prevents the shampoo from stripping off the natural oil in the hair. You can also apply some Jojoba oil when the hair is still damp from a hair wash. The oil can form a thin waxy coating on each hair shaft, protecting it from the dust and dryness. Dandruff is a very common complaint, almost everyone experiencing this irritating and embarrassing scalp condition at some stage in life. This condition is the result of scalp cells dying off at a higher than normal rate due to various reasons. Dryness of the scalp is a leading cause of dandruff; and it can very well be addressed by Jojoba oil application. Shampoos containing zinc and selenium are commonly used to treat dandruff. It should be noted that Jojoba oil is naturally rich in these minerals, and that could be contributing to its effectiveness in controlling dandruff. Jojoba oil’s antifungal properties also may come in handy since dandruff is often complicated by fungal infections. Most people who have psoriasis may develop scalp psoriasis at times. The skin on the scalp peels off in silvery flakes resembling dandruff. Many topical creams effective on psoriasis-affected skin elsewhere in the body may not be as effective on the scalp. Because of the hair growth, thorough application and washing off may be difficult too. Jojoba oil is easy to apply and spreads well on the scalp as this wax is in liquid form in its natural state. It can clear up sebum and dead cell buildup by penetrating into the hair follicles and lifting up the debris which then washes off easily. The anti-inflammatory oil soothes the skin and reduces redness and itching. The vitamin E and other antioxidants in the oil may also help bring about favorable immunological changes. Would you like to try this amazing oil and start improving your skin, hair and health today? 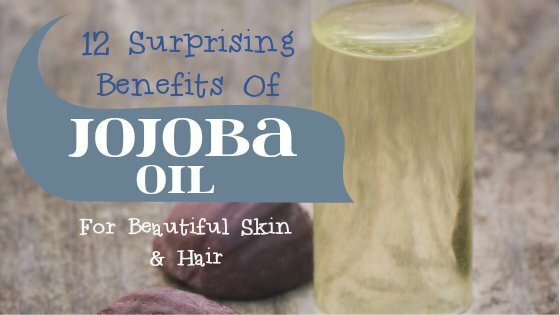 Once you start using Jojoba oil and seeing what it can do for you, you’ll be hooked! Jojoba oil is readily available online and this Leven Rose Organic Cold Pressed Unrefined Jojoba Oil is widely regarded as the best and most popular. It comes with free shipping and you can also get a discount with “Subscribe & Save” to get a monthly delivery. You can buy Leven Rose Jojoba Oil here on Amazon. Want to explore the incredible benefits of more carrier oils? Take a look at our articles on coconut oil, sweet almond oil, Argan oil and avocado oil.